Katharine Hepburn Brownies are named after the famous actor. The story goes that gossip columnist Liz Smith got the recipe from the actress to publish in her column. That was about 25 years ago and since then these brownies have only grown in popularity. This brownie recipe appears in countless cookbooks and with good reason. They are delicious. While the top crust is dry and cracked, underneath they are sweet, moist, and chewy, with a pleasing chocolate flavor. You can eat them warm, at room temperature, or even cold. These brownies are made in one bowl. You can mix the ingredients together with a wire whisk or you can use a handheld electric mixer. The brownies are made with unsweetened chocolate, which is also known as baking, plain or bitter chocolate. It is chocolate in its rawest form and this means that unsweetened chocolate is just ground cocoa nibs that have been refined and contain between 50-55% cocoa butter (cacao fat). This type of chocolate contains no sugar so it has a strong, bitter taste that is used in cooking and baking but is never eaten out of hand. Finally, there is always the debate of whether brownies should contain nuts. It is really a personal choice so you can add them or leave them out as you choose. Personally I leave them out and add chocolate chips instead which add a pleasing crunch and even more chocolate flavor. I prefer to chill these brownies overnight before serving. 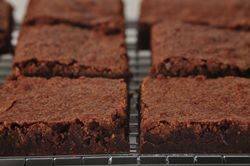 I find the texture of brownies becomes more fudgy and the flavors have time to develop. Katharine Hepburn Brownies: Preheat oven to 325 degrees F (165 degrees C) and place rack in center of oven. Butter an 8 inch (20 cm) square baking pan and line the bottom of the pan with parchment paper. Melt the chocolate and butter in a stainless steel bowl placed over a saucepan of simmering water. Remove from heat and stir, or whisk, in the sugar. Next, stir in the vanilla extract. Whisk in the eggs, one at a time. Finally, stir in the flour, salt and chopped nuts or chocolate chips (if using). Pour into the prepared pan and bake for about 30 - 35 minutes, or until a toothpick inserted in the center comes out with a few moist crumbs clinging to it. Remove from oven and let cool on a wire rack. Then cover and place in the refrigerator overnight. Serve at room temperature or chilled. These freeze very well.